Why delete the connector space? The overall goal or purpose of this document is to provide guidance and instruction when the need arises to delete a connector space. 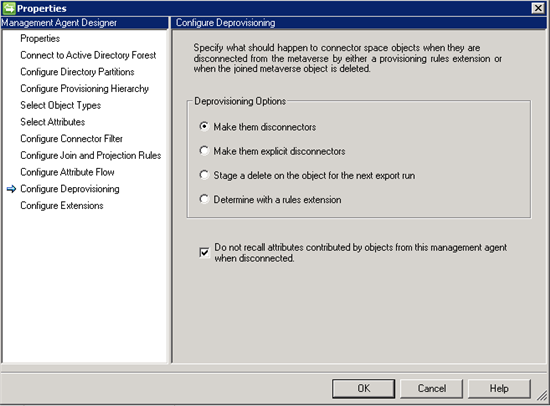 The document will cover steps that should be done, and should be thought about prior to deleting the connector space. 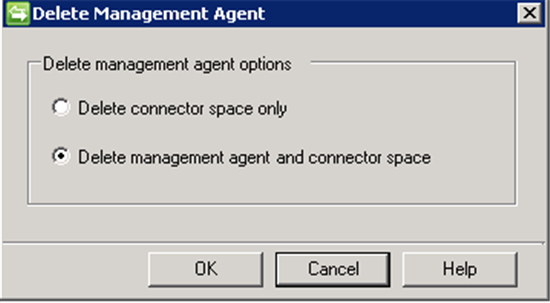 The need may arise where you have to actually delete the Management Agent as well. If you do have to delete the Management Agent, then here are steps to back up the Management Agent. If you do not have to delete the connector space, then skip this section. Use the Management Agent Configuration Viewer to view the information in the Management Agent in a clean HTML format. It will help you review the existing information. 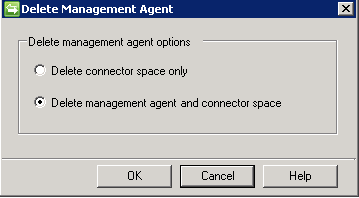 If you are actually deleting the management agent, then you would choose the second radio button. However, it is still very important to go through all the pieces of this document to ensure that we can get back to a previous state should the need arise. 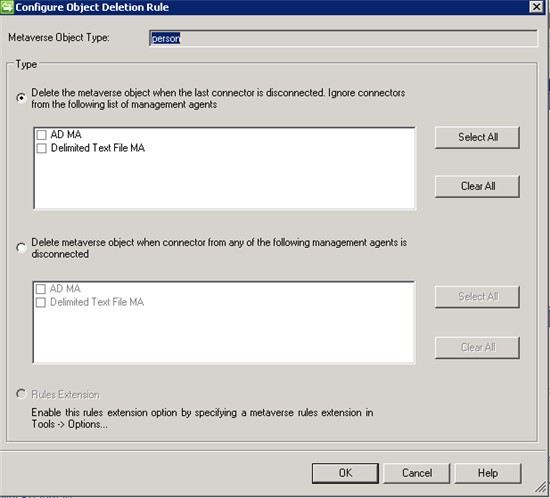 If you have not exported the management agent prior to deleting the management agent, then you will have to re-create the management agent from memory or restore a backup of the backend SQL Server database and go through the steps again. At this point, you are ready to rebuild the Management Agent. If you have not already downloaded and installed the Resource Kit 2.0 for the Microsoft Identity Integration Service 2003, please do so now as the Management Agent Configuration Viewer is a valuable asset when having to re-create the Management Agent. Use the information in this HTML file to rebuild the Management Agent. If you want to walk the object all the way through, then click Start Preview, and then click Commit Preview. At this point, the object that you are working with here should be joined. At this point, you can make the decision to continue testing with one object, or to press forward and run a Full Synchronization on the Management Agent to join all objects to existing metaverse objects. We are ready to re-enable provisioning. If you are using Synchronization Rule Provisioning, you need to ensure that one is enabled as well. Now, based on your decision above, you can continue working/testing with one object in with provisioning enabled. If you do, simply go through the steps above in Bring the objects back into the metaverse starting at number 10. Once you are satisfied with how one object looks, you will then be ready to run a Full Synchronization with Provisioning enabled.